Here is a letter I recently wrote to well-known author and investment advisor, Jim Rickards. 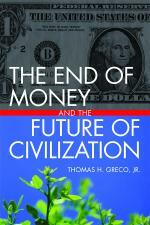 I’ve recently read your books, Currency Wars and The New Case for Gold. Your analysis of the global situation and financial instability are largely consistent with my own views, and your perspectives based on your high level contacts in government, banking and finance have been helpful. I strongly agree with your conclusion that “the global monetary system is headed over the cliff” and that there seems to be, in “policy circles,” little cognizance of it or willingness to embrace solutions. Quite clearly, the control of money has enabled the centralization of power and concentration of wealth that is now reaching extreme proportions. That is why I have devoted most of my energies over the past 35 years to developing private, market-based, innovative systems for mediating reciprocal exchange and providing equitable and sustainable approaches to finance. I believe that reform of the global money system is not possible so we must create exchange mechanisms that do not involve banks nor require payment in dollars, euros, yen or any other political currency. There are established precedents that can be optimized and scaled up to eventually replace the present system that we agree is not sustainable. In the face of imminent collapse of the global financial system it is not enough to try to preserve whatever wealth a few of us may already have, we must find ways to ameliorate the negative impacts of collapse and develop replacement systems before the crisis reaches the panic stage. The coming breakdown of global finance can also be the opportunity to install decentralized systems that are stable, sustainable, and work for the benefit of everyone. The most promising strategy in my opinion is to bring to market sound private and community currencies and to establish networks of direct credit-clearing circles that enable traders to create their own liquidity for themselves and their communities based on the real value of the goods and services they produce and sell. Many such circles already exist in the form known as “Trade Exchanges” or “Barter Exchanges.” These enable businesses to trade with one another without using conventional money but instead by allocating sufficient credit to members within each circle to offset their purchases against their sales. So long as a business remains a member of the circle there is no need to settle their accounts provided that their balance remains within proper bounds and there is a reasonable flow through their accounts. One such trade exchange, The WIR Economic Circle Cooperative, founded in Switzerland in the midst of the Great Depression in 1934 as a self-help organization, has been operating successfully for more than 80 years (It is now called the WIR Bank and has added conventional banking services to its activities). While your investment advice may be beneficial to the relative few who have a nest-egg to protect, survival in the face of chaotic breakdown of social, political, and financial structures (including markets), will require more comprehensive strategies based on cooperative, decentralized, peer-to-peer approaches to reciprocal exchange and finance. Are you willing to apply your significant abilities and resources to developing and implementing them? The very survival of civilization is at stake.